I am going to Assen -- How does one get this badge?? I'm not going to Assen...... how do I get the badge! Cheeky I know, but one can only try!! Machiel Kalf had these at Newmarket. There is also a superb poster which is the same except the man with the flag is in front of the car. The design is absolutely superb, and I don't usually gush about much. Machiel can be contacted via Mogtalk - I don't think he logs on here very often, but I believe that you will be able to buy one and have it sent over. Now that is one Smart Car Badge. I missed that one! I don't think he logs on here very often, but I believe that you will be able to buy one and have it sent over. I've contacted Machiel and have asked if the badges can be bought via mail. I have also mentioned that there may be a few people on here who could be interested in purchasing them and if they are readily available, perhaps he could post up instructions on how to purchase on TM. Machiel has kindly responded to my mail. The badge can be ordered from the MSCC NL web site. 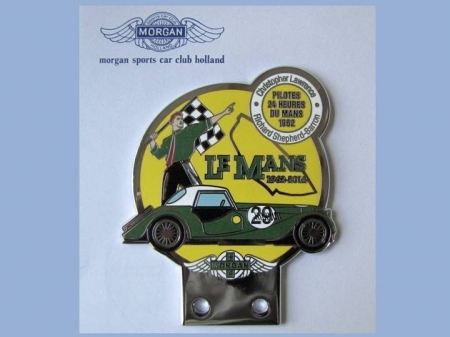 Here is a direct link to the Morgan Assen 2012 commemorative badge . He has also given me a direct link to purchase the badge, it is 5 Euro cheaper but it does mean you have to send money in the post; which imho, makes it slightly less attractive due to the risk of the money going missing in transit. Machiel Kalf had these at Newmarket. There is also a superb poster which is the same except the man with the flag is in front of the car. .............. and I don't usually gush about much. NOT TRUE!! !Dont you mean apart from Morgans Dave?